David Eagleman is a very smart person with an infectious enthusiasm for how the brain works. He does an excellent job describing how much of what happens in our brain is typically beyond our conscious awareness, like changing lanes on the highway, for example. 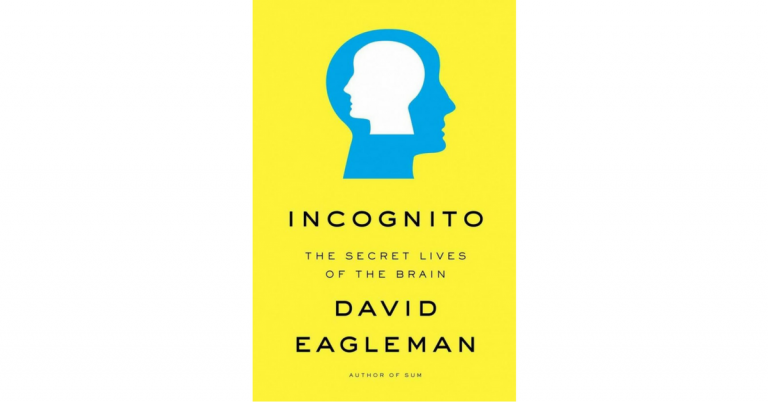 In Incognito: The Secret Lives of the Brain, Eagleman spends a significant portion of the book discussing free will and especially focuses on how our legal system should adopt these advances in neuroscience — this is extremely important for politicians, judges, and lawyers to consider, but may not be as relevant for professionals in other industries (unless you are particularly interested in these issues). The relevance for all individuals though, is that Eagleman shares about how our brains remain hidden from us, empowering readers to become more aware of and better able to override the ‘default network’ of the brain. Overall, Incognito provides insights and data about how the brain works in mysterious and often hidden ways. Disclaimer: If the legal system is of no interest you, I would recommend starting with other books in Happy Brain Science’s Recommended Reading.